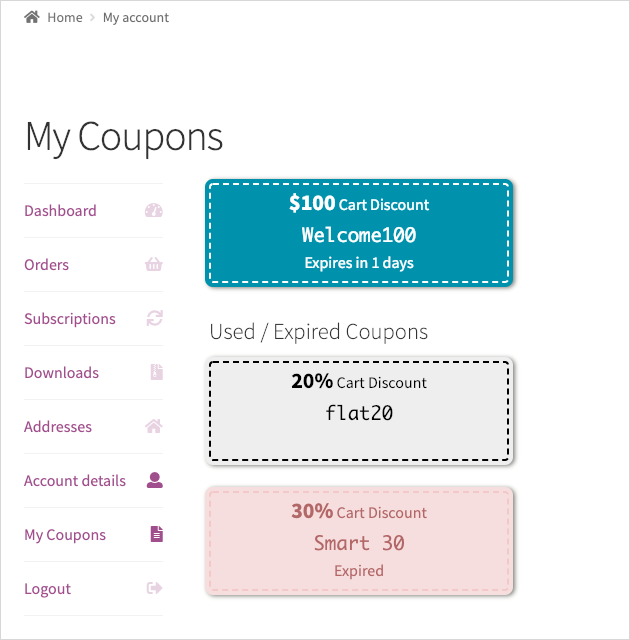 Smart Coupon for WooCommerce is an add-on plugin, tailor-made to meet varied coupon specific functionalities. 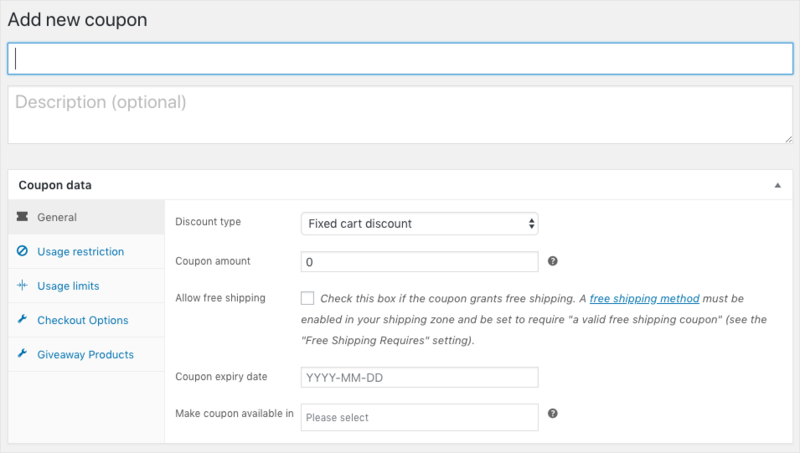 The additional functionalities like issuing a Coupon with various Checkout options, Giveaway products, Bulk generation, and Import are conveniently integrated with the standard WooCommerce Coupon panel. 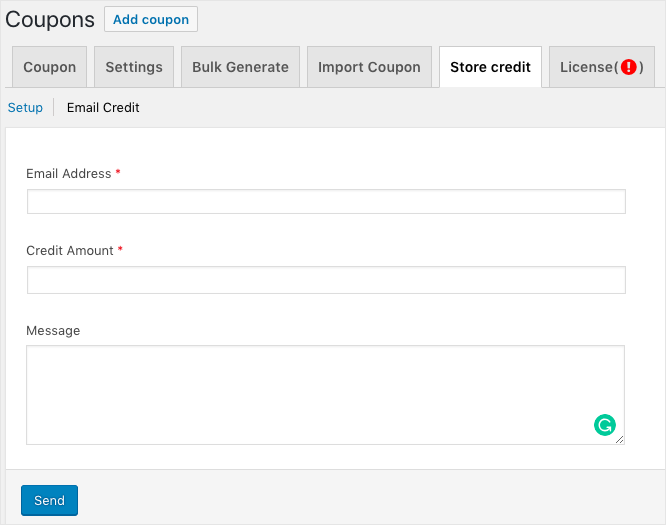 After purchasing the Smart Coupon Plugin For WooCommerce, the plugin will be available as a zip file in the API Downloads section of your My Account page. 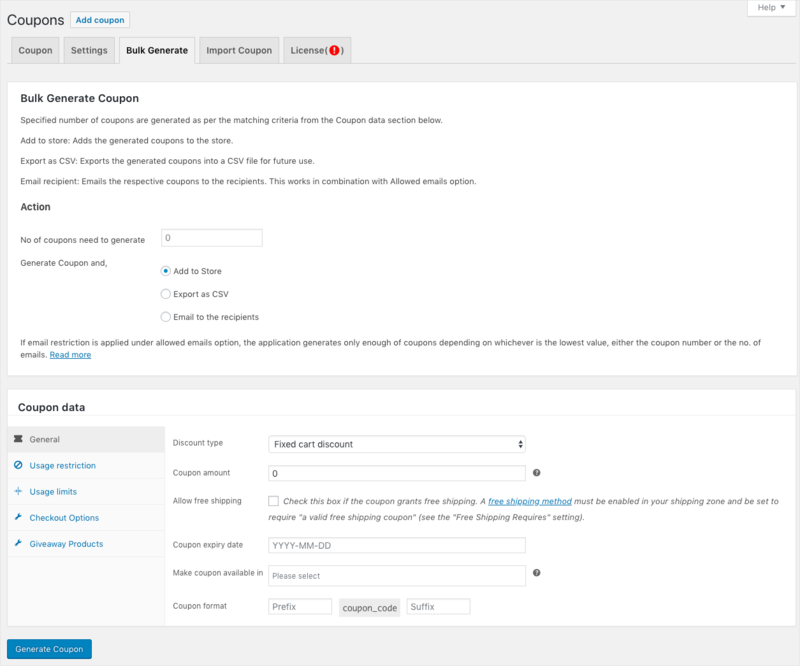 Once the activation is successful, you can then navigate to WooCommerce > Coupon from WordPress dashboard. The coupon tab consists of two sections as Add new coupon and associated Coupon data. Create a new coupon by selecting Add Coupon. Or hover over an existing coupon for an Edit. Description (optional) — Info about the coupon, e.g., Dates in effect, promotion, compensation, ticket number. Used for internal use. Alternatively, the plugin allows you to Duplicate an existing coupon which will clone an exact copy of the chosen coupon. You may then edit only the necessary sections that need to be changed. Under Coupon Data, you will find the following sections: General, Usage Restriction, Usage Limits, Checkout Options, and Giveaway Products. Discount type – Select from the various discount types in the drop-down. Coupon amount – Fixed value or percentage, depending on the discount type you choose. Entered without a currency unit or a percent sign, e.g., Enter ’10’ for £10 or 10%. Allow free shipping – Removes shipping cost when a coupon is used. Requires Free Shipping to be enabled. Coupon expiry date – Set an expiry date for the coupon. Make coupon available in– Lists options to make the coupon available in MyAccount page, Cart and/or Checkout. Individual use only –Check this box if the coupon cannot be used in conjunction with other coupons. Exclude sale items –Check this box if the coupon should not apply to items on sale. Per-item coupons will only work if the item is not on sale. Per-cart coupons will only work if there are items in the cart that are not on sale. 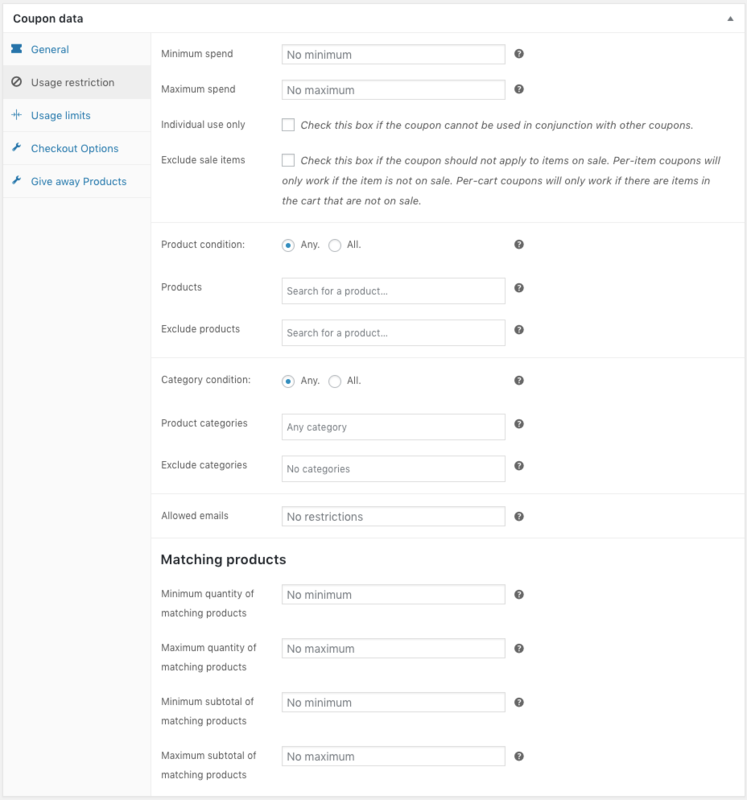 Product Condition – By default Coupon will be applicable only if any of the products from the selected list is available in the cart; all option requires that the cart contains all of the selected products. Category Condition – Coupon will be applicable only if any of the categories from the below is available In the cart; all option requires that the cart contains products from all of the listed categories. Allowed Emails/Email restrictions – Whitelist of billing emails to check against when an order is placed. Separate email addresses with commas. You can also use an asterisk (*) to match parts of an email. For example “*@gmail.com” would match all Gmail addresses. Minimum quantity of matching products: Minimum quantity of the products that match the given product or category restrictions. If no product or category restrictions are specified, then the total number of products is used. Maximum quantity of matching products: Maximum quantity of the products that match the given product or category restrictions. If no product or category restrictions are specified, then the total number of products is used. Minimum subtotal of matching products: Minimum price subtotal of the products that match the given product or category restrictions. Maximum subtotal of matching products: Maximum price subtotal of the products that match the given product or category restrictions. Shipping Methods: The coupon will be applicable only if the shipping methods matches any of the entries selected here. Payment Methods: The coupon will be applicable only if the payment method applied during checkout matches any of the entries listed here. Applicable Roles: The coupon will be applicable if the customer belongs to any of the roles listed in this field. Restrict by Country: Restrict the usage of the coupon on the basis of billing address or shipping address. Country: Select the location from the list for restricting the coupon usage. Free Products: A single quantity of the specified free product/s is added to the customer cart when the coupon is applied. Apply Discount before tax: Check this to discount the tax of the giveaway product in addition to the product price. This is applicable by default. The settings tab is categorized into two categories as Style and General. 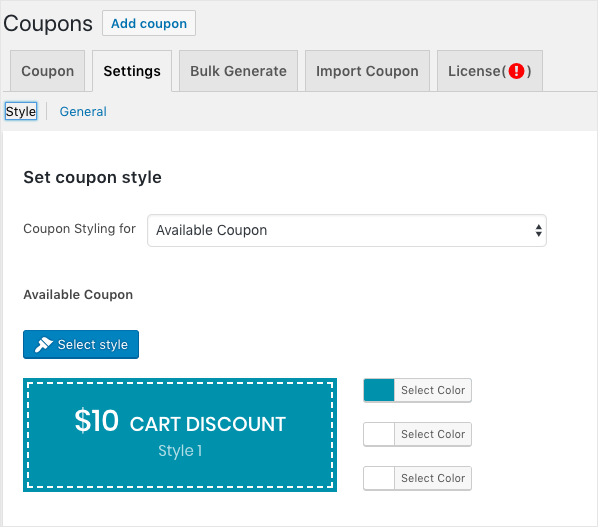 Style: Choose from pre-defined coupon designs, choose background color, text & border color (as per your theme’s color scheme) included in the Select Style button. Provision to customize the style of an active coupon, used coupon and expired coupon. Alternatively, choose a style from among the pre-defined coupon styles. Bulk Generate: Length of the coupon code option can be used to set the length of the coupon code that is generated automatically excluding prefix and/or suffix. The default length of the auto-generated coupon code is 12. Gift coupon on product purchase: The gift coupon is emailed to the recipient on the basis of selected order statuses as either completed or processing. A specified number of coupons are generated as per the matching criteria from the Coupon data section. The generated coupons can be: added to the store, exported as a CSV or emailed to the recipient directly. 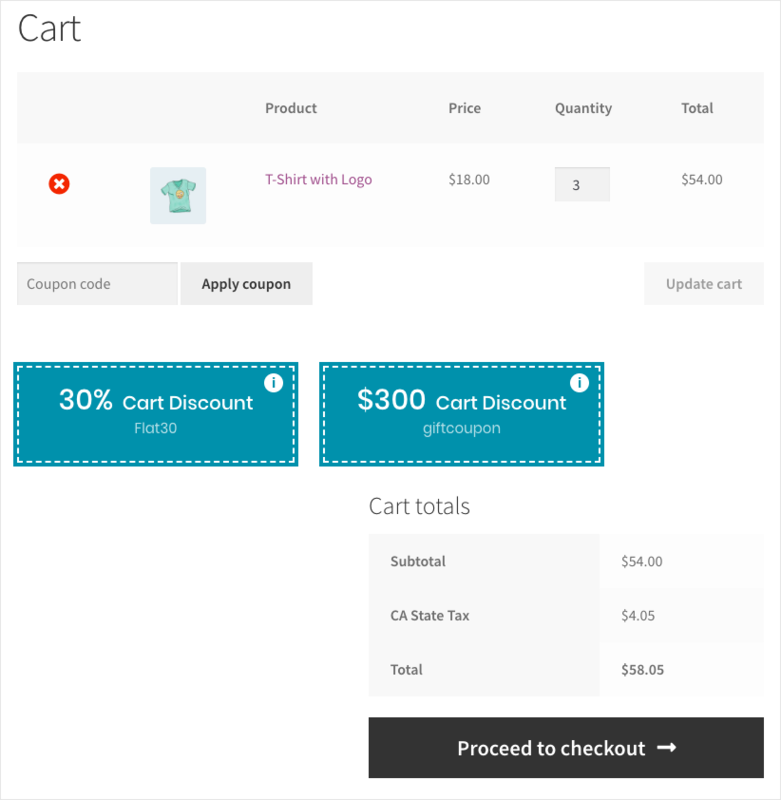 Add to store: Adds the generated coupons to the store. Export as CSV: Exports the generated coupons into a CSV file for future use. Email recipient: Emails the respective coupons to the recipients. This works in combination with Allowed emails option available under usage restriction. Once the settings are in place, assign a prefix and suffix for the coupon if required. The coupon_code is a unique randomized alphanumeric character of length 12 which will be generated automatically. Click on Generate Coupon button to issue coupons as per the pre-defined configurations. If email restriction is applied under allowed emails option, the application generates only enough number of coupons depending on whichever is the lowest value, either the coupon number or the number of emails. Even though 10 coupons are given for generation only two coupons will be generated and assigned to those restricted users. Alternatively, if you provide 2 coupons and 10 emails, only two coupons will be generated and assigned to the first two email ids. For a clean import, the CSV must include the header and adhere to the format as indicated in our sample file. Columns post_title and discount_type are mandatory for the import. Duplicate coupons will be skipped during import. Choose a CSV file from your system. Click on the Upload file button. 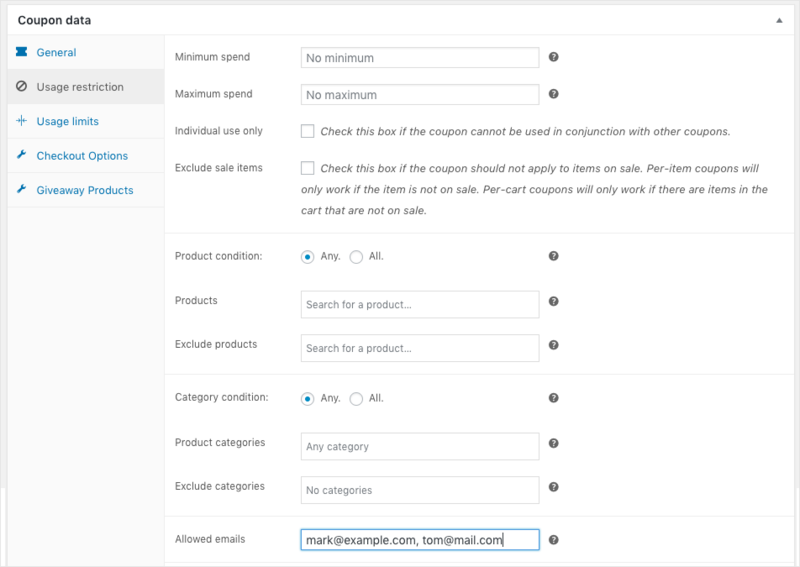 To email coupons to concerned recipients on import select the checkbox. The coupons will be imported into your store. Smart coupon offers a comprehensive store credit functionality where the customers can easily purchase store credit, email it as a gift card for friends or use it for themselves. Store credits can be used in combination with other coupons even for multiple purchases until the value specified is exhausted or when the coupons life expires. Alternatively, the plugin also allows the store owner to email personal store credit vouchers directly to customers using the Email Credit option. The store credit setup consists of fields to specify the maximum and minimum range of store credit vouchers that can be purchased, select order status for which the vouchers have to be sent and provision to define the format of the store credit vouchers. Manage tax: Enabling this option discounts the credit prior to calculating the tax. Associate a product: A zero priced product has to be selected from the available list. Minimum credit purchase: Enter a minimum value of the store credit that can be purchased using the associated product. Maximum credit purchase: Enter the maximum value of the store credit that can be purchased using the associated product. Note: While purchasing the store credit the minimum value and the maximum value by which the voucher can be purchased will be displayed in the front end of your store. Email store credit on order status: Purchased store credit will be emailed only for the selected order status as either completed or processed. Store Credit coupon format: Specify the Prefix, Suffix and Coupon length in the field provided. Individual use only: Check this box if the store credit voucher cannot be used in conjunction with other coupons. Gift cards/store credit vouchers are something that retains customer’s attention and helps in elevating sales. Using email credit, the store owner can directly send the store credit voucher via email to specific clients deserving special discounts. Email Address: Key in the email addresses of the recipients in this field to send store credits individually. 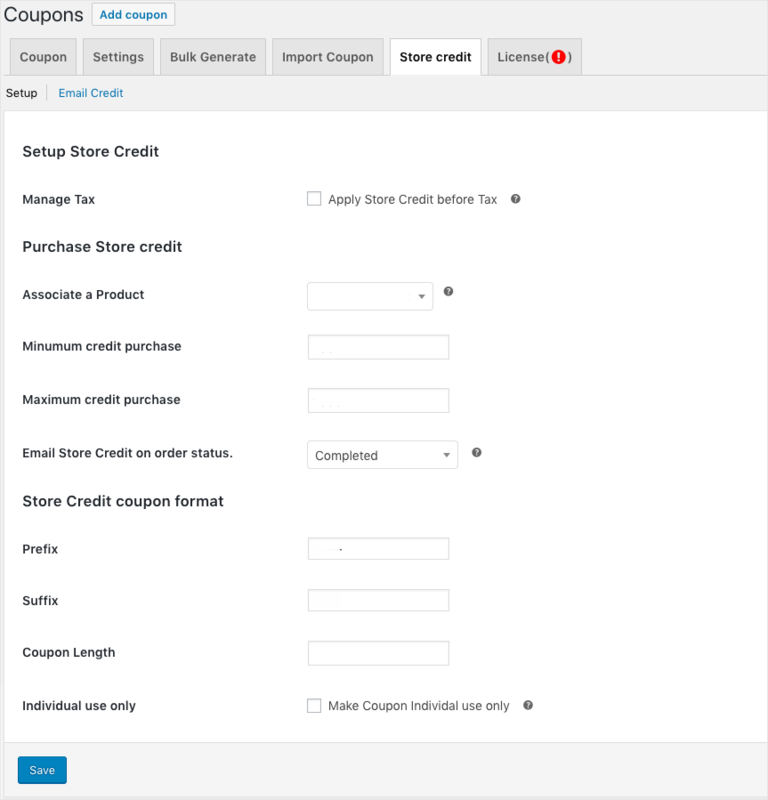 Credit Amount: Enter the store credit amount in this field. Message: Optionally a message can be included while emailing voucher to the customer. Once the above fields are filled in, click on send to mail the store credit vouchers to specified recipients. 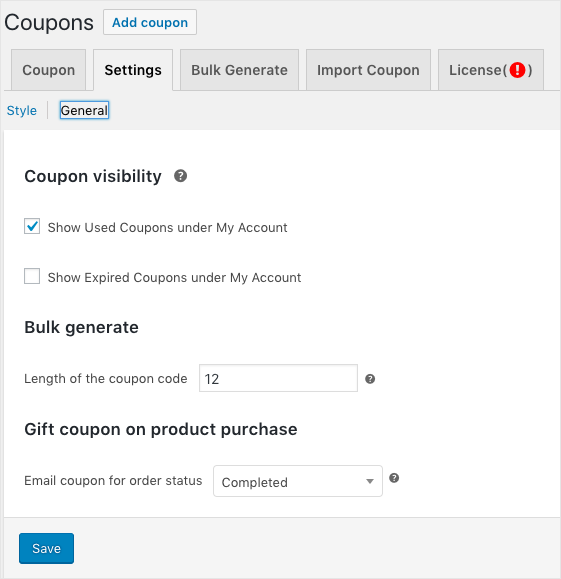 Smart Coupon gives a provision to view the currently active coupons, used, as well as expired coupons from the MyAccount, Cart and/or Checkout sections as shown below. The user can simply click on an active coupon to redeem it from MyAccount, Cart or from Checkout. 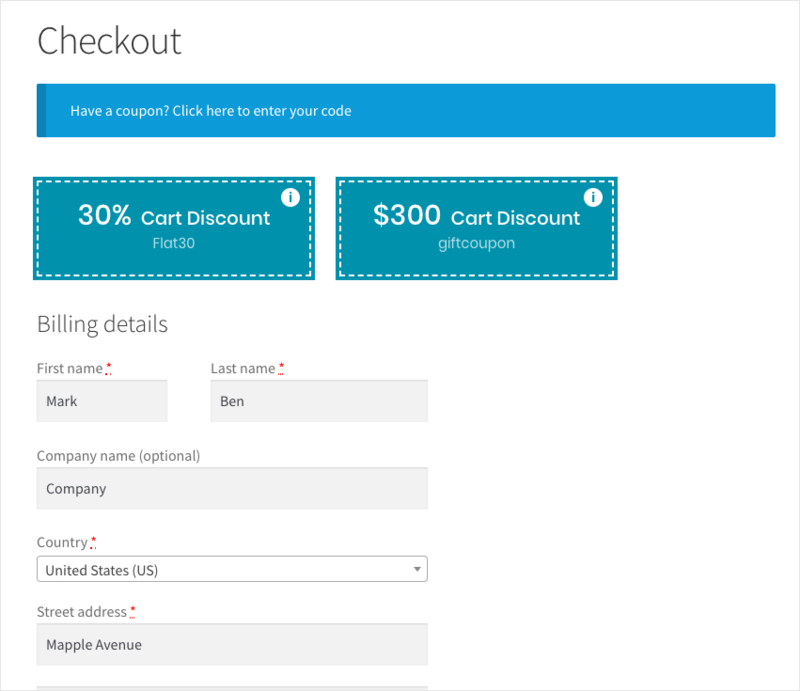 This entry was posted in Documentation, Getting Started, Smart Coupons for WooCommerce, WooCommerce. Bookmark the permalink.